Ralph Waldo Emerson had the unique ability to condense a whole philosophy into a few words. Nature is not to be worshipped as it is only a creation, not the Creator. Pierre Teilhard de Chardin stated, "Our duty, as men and women, is to proceed as if limits to our ability did not exist. We are collaborators in creation." King Solomon wrote, "But why is mortal man so important to You?...You put him in charge of everything You made. You put all things under his control..." (Ps 8:4-7 Quote from International English Bible www.iebible.net). Man cannot create the acorn but He can plant one and with the elements of creation at his disposal begin to see the results of his working with nature. The power within the seed has no known limits...like space itself. Even so the mind of man has no known limits for its ability to create results of his imagination. Abundance is a common yet voluminous word which needs to spark our day if accomplishment is our objective. It may be one small thing...like a decision that makes our life unique and unforgettable...and our night following, a happy rest! We were born to achieve. 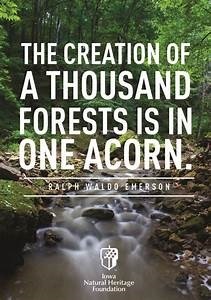 Emerson knew this and encapsulated a memorable giant of an idea in simple terms from the "book" of nature, "The creation of a thousand forests is in one acorn". Let's remember that so our day will be full and our life well lived.